New York, N.Y., June 25, 2015 – For the first time HBO is offering free access to view its two newest original comedy series, Ballers and The Brink, on Facebook. Effective immediately, the first full episode of each series will be available for a limited time. 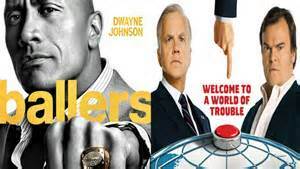 Ballers star and executive producer Dwayne Johnson will host the episode directly on his Facebook page (https://www.facebook.com/video.php?v=10153597196099384), which will include a video introduction by Johnson, and The Brink can be seen on the series page (https://www.facebook.com/TheBrinkHBO/videos/917793438276821/). Called “welcome summer additions” (USA Today) and “worth a look” (Los Angeles Times), Ballers and The Brink are not to be missed. Showcasing the two comedies on Facebook expands HBO programming sampling efforts to a new platform and, with Johnson’s expansive fan base of 49 million followers, it is a natural fit to reach an already primed audience. The sampling opportunity comes just days after the series premieres on Sunday, June 21, at 10:00 p.m. (Ballers) & 10:30 p.m. (The Brink) and will be promoted on HBO’s Facebook and Twitter profiles as well as Johnson’s Facebook, Twitter and Instagram accounts for Ballers. In addition to Facebook, the episodes are also available on HBO NOW and HBO GO. Consumers new to HBO NOW can sign up now for a free 30 day trial that includes access to the best past and current programing. Created by Stephen Levinson (HBO’s Entourage®) and executive produced by Stephen Levinson, Mark Wahlberg, Dwayne Johnson, Dany Garcia, Peter Berg, Evan Reilly, Rob Weiss, Julian Farino and Denis Biggs, Ballers explores the whirlwind lifestyle and real-life problems of a group of former and current football players and was graded an “A-” by Entertainment Weekly. In the series Johnson (San Andreas) portrays Spencer, a retired football superstar who is trying to reinvent himself as a financial manager for current players in sun soaked Miami. The epic dark comedy series The Brink focuses on a geopolitical crisis and its effect on three disparate, desperate men: Secretary of State Walter Larson (Tim Robbins, Best Supporting Actor Oscar® winner forMystic River), lowly Foreign Service officer Alex Talbot (Jack Black, Golden Globe nominee for “Bernie”) and ace Navy fighter pilot Zeke Tilson (Pablo Schreiber, HBO’s The Wire®). The series was executive produced by Jerry Weintraub, Roberto Benabib and Jay Roach, who also directed the pilot, and was created by Roberto Benabib and Kim Benabib.